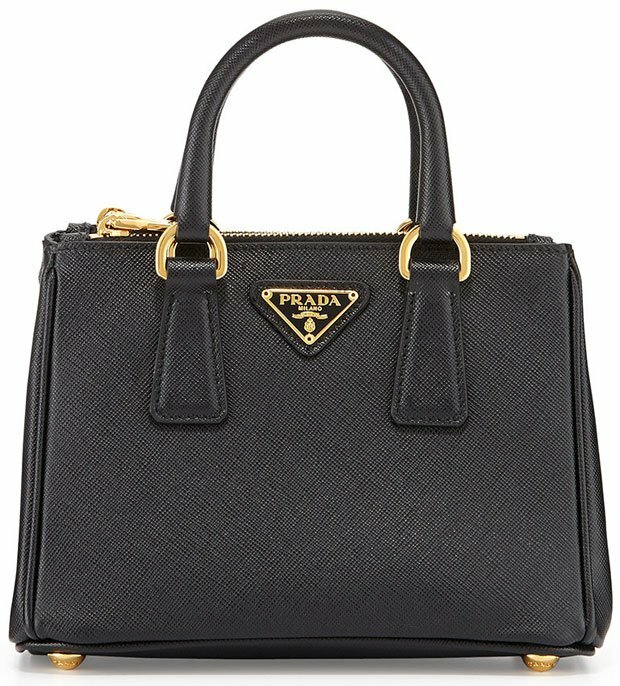 Another batch of Prada goodies are up-for-grabs this season, ladies! And we’re definitely sure that you’ll love ‘em…presenting, Prada Saffiano Multicolored Leather Flap Wallets, in different colors to choose from! If you’re crazy about basic shapes and block colors, then these pieces are definitely for you. It appeals to most tastes, how simple or outrageous they may be. This piece is made with only the finest leather, some strong and resilient material that’s sure to stand the test of time. It also has snap closure, which is sure to keep all of your personal effect secure. Inside, it’s even better – it has ten credit card slots, a coin compartment with zipper, and outside pocket with zipper closure, four document pockets, a bill compartment and (get this!) an extractable badge holder with chain that comes with two extra credit card slots! That was a mouthful, alright…’coz it’s super organized! Measuring 18.7cm x 9.5cm, you can get your very own Saffiano Multicolored Leather Flap Wallet via Prada e-store. 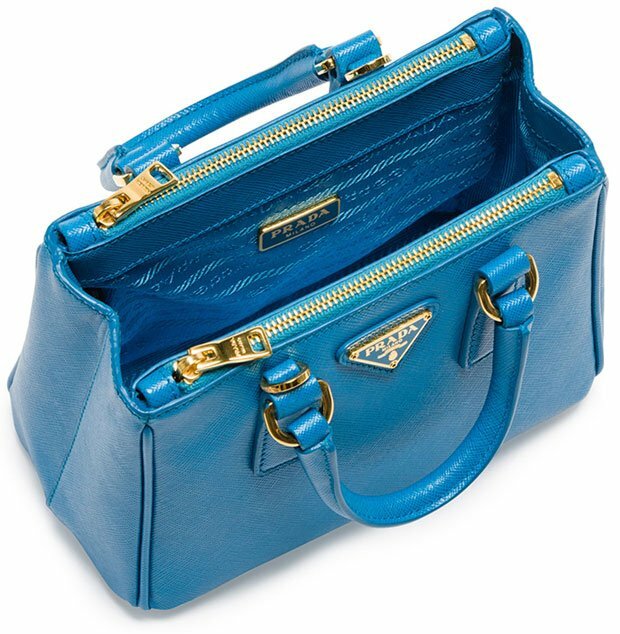 I hope you’ve budgeted ‘Prada handbags’ for the year 2015 , because what the previews (or what the ad campaign Spring Summer 2015) are showing is dangerously obsessive. 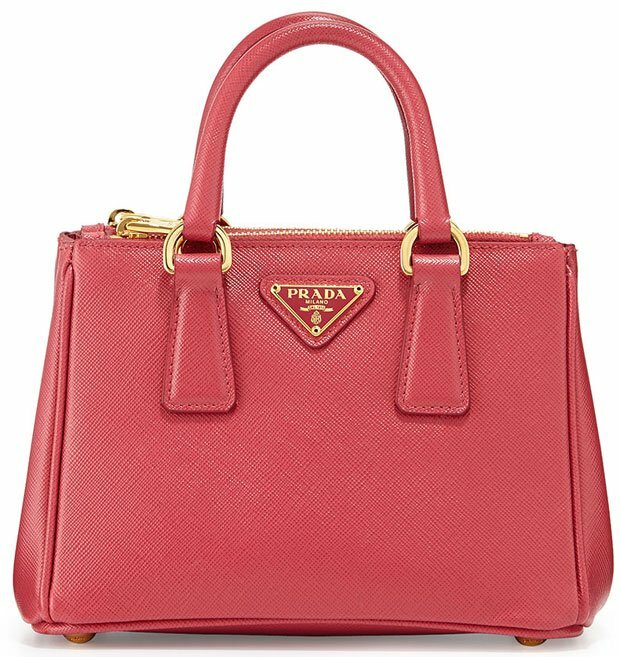 Prada Double Tote Bag has gone through some changes in style – now completely modernized, in multi-color, now it shines even better on your casual outfits. The saffiano leather does not need any introduction and ever fashionista knows that you can always count this fashion brand for practical tote bags. Prada also introduces a new duffle bag. Though in black with detailing on the corners, it’s actually very chic. It goes well with casual dresses and its made with plenty of spaces to store your essentials. The bag is made in the exact size you want to carry, handles comfy around your right arm and you’re good to go. Many saffiano handbags have been revealed in multic-colored leather, but also nylon and exotic leather. What is even more intriguing is the new backpack in brown and black. It comes with the same handle like a tote bag. And so when DIOR launched the Be Dior Flap Bag, it was just a matter of time that they would introduce the mini Be Dior Flap Bag. In the interior you can find a zip and open pocket to store all your essentials. There is also a zip compartments in the frame front and back. It’s simple yet sophisticated, measuring 4.75’ x 6.5’ x 3.25’ (H x W x D) inches, priced at $1,050 USD, pre-order at Neiman Marcus. Make the most out of the Holiday season by giving the best gifts to your loved ones. Go all out this year by splurging on presents for your friends and family. Here are 10 gifts ideas under $3,000 from top luxury designers, including Chanel, Louis Vuitton, Hermes, Givenchy and more! If you are going to go all out this year on gift giving, start with Chanel. The Chanel Patent Classic Flap Mini Bag makes a lovely present to your little sister. The bag’s turquoise color is fun to use anytime of the year. Available in Chanel boutiques for $2,900.00 (USD). Louis Vuitton never fails to create stylish handbags for day or night. This gorgeous Lockit tote bag is made of Monogram Vernis that you can use for casual or formal occasions, with its elegant Dune color. You will surely bring a smile to your mother when you gift her this timeless piece. The Collier de Chien Bracelet is one of Hermes’ popular jewelry. This PM size is just the right size for your arm that you can use for casual days, at work or night outs. Celine’s latest design, the Orb Bag is from the Winter 2014 Collection. This bag is the perfect gift for your fashionista friend, who’s always on top of the trend. The bag has a single handle with a flap front and a rounded metal button. The bag retails for $2,600.00 (USD). 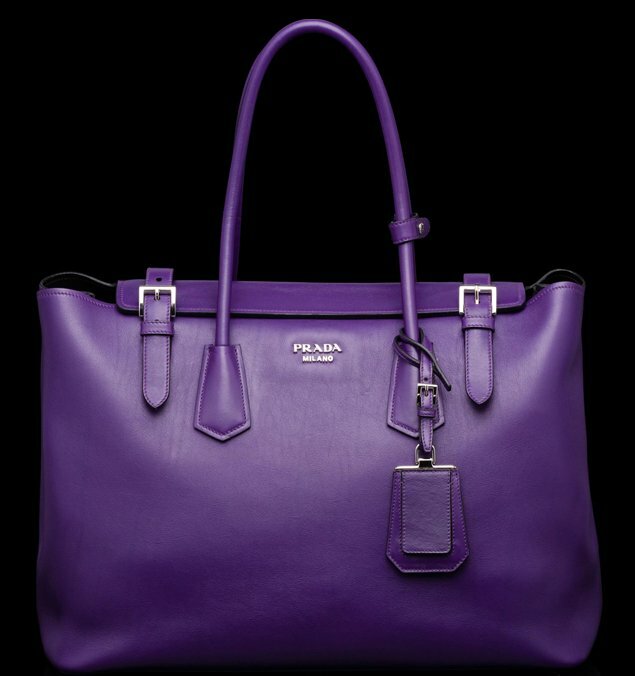 Prada’s iconic Saffiano Tote makes a perfect present not only for your loved one but also for yourself. The bag has a simple yet a classic and timeless design that you can take anywhere. It includes a removable and adjustable shoulder strap. It is ideal to use everyday with its various compartments and expandable snap sides. This Givenchy Boyfriend will keep your outfit in style. It is made of wool with two-tone striped border on the hem. It has an oversized fit that matches perfectly with a basic tee and skinny jeans. Buy this for $2,890.00 (USD). The Valentino Rockstud Backpack Bag is best to give to someone who loves to travel. This bag will definitely carry one’s travel essentials, and it’s hard to lose with its bright red color. It features the iconic Rockstud design and it’s made of calfskin. One of the biggest trends this year is the Drawstring Bucket Bag. This bucket bag from Saint Laurent features a python embossed leather. It has an edgy look with its zip and buckle details. It has a drawstring top and adjustable shoulder strap. This unique watch from Fendi features a a rolling stone mechanism on the the watch that will allow you to display different stones. You can choose from 11 rainbow topaz, or 11 pink topaz or 11 white topaz. A single stationary diamond is placed at 12. A total of 3.61 carat weight for all the gemstones, and 0.04 for the diamond carat weight. Aside from the Motorcycle Bags, Balenciaga is also famous for its Biker Jackets. This chic biker jacket is made of grained leather. It has vertical pockets at front and will surely keep you warm in style during the cold season.